Chris Kimbrough runs four laps, drinks four beers in 6:28.6. On Sunday afternoon, Chris Kimbrough, a 44-year-old mother of six, shattered the women’s beer mile world record by 13 seconds, running 6:28.6 in her first attempt at the event. The previous record was held by Seanna Robinson, who ran 6:42.0 in 1997. Beer mile records are not recognized by USATF or the IAAF, of course, but they are tracked at BeerMile.com, where a list of widely used rules can be found. The general idea is that competitors drink a beer, run a lap, and repeat the sequence three times. The beer mile originated in Canada in 1989, and for a while, was mostly run by college-aged males looking for some fun. But with several high-profile record attempts in recent years, combined with Flocasts putting on its first Beer Mile World Championship in Austin, Texas, on December 3, the event has become more popular than ever. Indeed, it was the announcement of the World Championship that eventually led Kimbrough, who lives in Austin, to the event. Over the summer, members of the Rogue Racing Team, which Kimbrough trains with, were discussing it and encouraged her to give it a try. As the owner of several masters national championships and one of the best local runners of any age, Kimbrough knew she had the speed. She hasn’t done a lot of track racing, but she estimates that she could run about 5:00 in a beer-free mile right now. 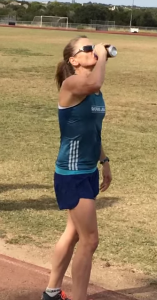 When she heard that she was being considered for inclusion in the beer mile field, she decided she had to see what she would be getting into. What was meant to be a low-key testing of the waters turned into something much bigger.